The Centurion walk caters for all. It is described as an adventure walk around the Dales and Howgills and may be split into short or long distances. No route description is available, just a set of grid references and the names of the places to visit en route. The framework is one of five stages, each with a starting point, with the choice left to the individual walker of what to visit and what to avoid. Route options include ascents of Whernside, Ingleborough and Pen-y-ghent - the 'Yorkshire Three Peaks' - along with the Coum, the Calf, Nine Standards Rigg, Tan Hill, Buckden Pike, Great Whernside and Plover Hill. A completion log book may be signed at Pen-y-Ghent Cafe where badges may be obtained. 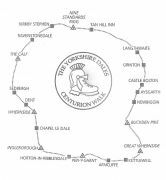 There is a 19-mile variant called Yorkshire Dales Centurian Walk - Mastiles Lane Alternative, from Horton in Ribblesale to Kettlewell around Parson's Pulpit via Malham Tarn using the Pennine Way National Trail in part.